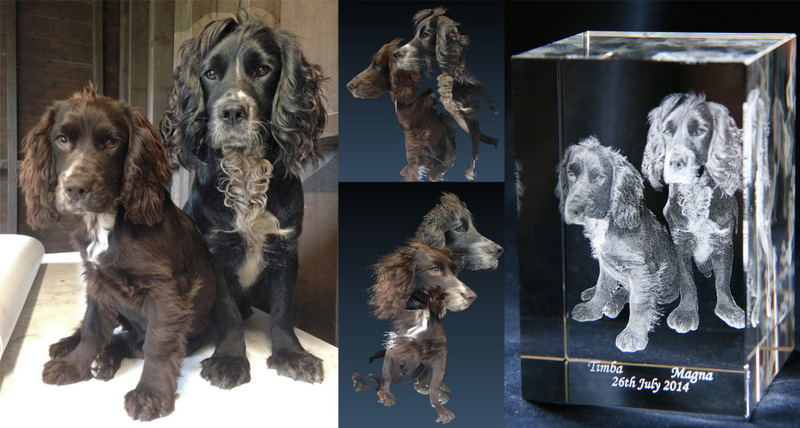 Crystalis3d Ltd - Converting your photos into 3D and laser etching into crystal glass – ever wondered how it is done? 3D laser etching is created by manipulating digital images with sophisticated software and a sub surface laser machine. Crystalis3d Ltd specialises in converting normal digital photos (2D) into 3D images and laser etching them into crystal glass blocks. Once the photo has either been scanned or received digitally, editing work is then carried out to create the final 2D image before converting it into 3D. This can include repairing a damaged photo, taking out the back ground, adding two or more photos together. With the latest software, designed and created in Germany, a CAD mannequin is created to emulate the 2D image. The subject matter of the photo can be anything ie pet, sport, cars, buildings, people, logos. Once the CAD mannequin has been created the photo is then wrapped around the 3D mannequin giving the photo a curved 3D effect. The next stage is to convert the 3D photo into a ‘point cloud’ this means that the 3D image is changed into thousands of dots, the light colours in the image being the most intense. Once the ‘point cloud’ has been created another software communicates with the sub surface laser machine calculating the X Y & Z axis of each image according to the size of crystal glass block they wish to work with from a range of sizes; 30x20x15mm to 200x150x100mm. High grade K9 crystal glass is transparent to laser light, so laser can pass through without causing damage. With the use of digital high definition control, the intensity at a given point exceeds the threshold within the glass crystal only were this is intended and effectively you can control the etching process with incredibly high precession. As a result a microscope point is made. By making many millions of points in this fashion the complete 3 dimensional image can be formed. When you look at an engraved crystal, the marked area shows up as white and unmarked area as background transparent glass. Once the image has been lasered wording can be added to crystal as a special message, name, date etc. Each crystal is made to the customer’s specifications creating a unique memento that will be cherished and appreciated, whether a memento, gift or trophy, personal or for business. Crystalis3d Ltd offers this unique service. With a Studio based in North Yorkshire, Crystalis3d also have a 3D scanner which can take perfect headshot portraits of people to be laser etched into crystal glass.